Top 4 Drill Attachments That Everyone Should Have in 2018 - Purros Machinery Co.,Ltd. Are you looking for drill attachments that you must have? A drill is one of the best tools invented to make boring holes easy. This is a handy and versatile tool that can be great for various tasks. There are numerous attachments that you will need. In this article, we have listed few of the most common attachments. Here are some of the attachments that every driller needs. One of the must-have attachments is the self-centering hinge bits. This is a great drilling bit for centered holes. With the help of self-centering hinge bits, you can bore a hole quickly and easily. This drill bit will help you place holes accurately and correctly. These bits are available in various sizes as one size doesn’t fit all requirements. It is better to have to 2 medium sized bits, which are capable of handling a wide range of doors and cabinets. All you have to is the place the nose of the bit in the countersunk rim of the hinge. This will enable you to have a precise hole for the screw. Another essential attachment is the Rotary Rasp. This attachment is great for grinding off the wood. It is also perfect for expanding existing holes or shaping them. The Rotary Rasp is good for use on various materials including wood and plastic. It is recommended to clean the rasp if you want to extend the lifespan of the drill. 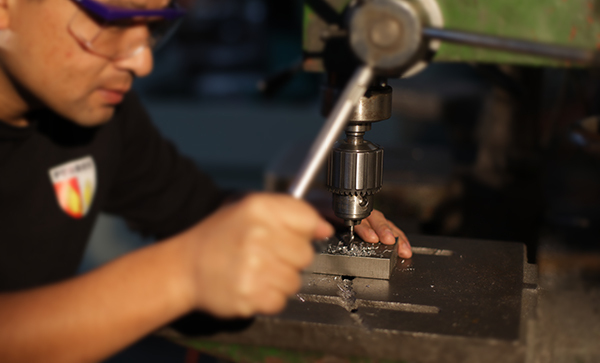 In case, you are depended on the drill, there might be a possibility that the motor or bearings might get damaged. Of course, the drill bit grinder can be repaired with a bit to repair it’s worn corners. You can either get a heavy duty drill or take a break from drilling. Furthermore, the Rotary Rasp is not a finishing tool. You must get a filer or sandpaper in order to have a smooth surface that is free from marks. You must apply slight pressure on the screw in the beginning and press harder later on. If you put pressure in the starting, it will lead to screw slipping away and causing damage to the surface. The heads of the screws are delicate, if you overdrive it, they will snap off. The Nut drivers are essential for both beginners and professionals. If you don’t have nut drivers, you will have to turn the driver using a wrench. A nut driver will make it easy to loosen up and tighten a nut without applying much force. All in all, with so many choices to choose from, it gets challenging to get the best. This is why you need an expert help. The PURROS Machinery is here to help you. In case, you need more information, feel free to contact our friendly customer support service. Posted in Technology and tagged drill attachments, drill bit attachment, drill bit grinder, drill bit grinder attachment, drill sharpening attachment, grinder attachments, grinder attachments for drill. ← How to Drill a Hole in Glass?